Dual function both blowing and vacuum. Inbuilt safety mechanism to protect motor. 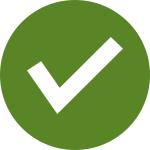 PLEASE NOTE: For optimal performance when sanding + vacuuming, it's advised that you use a perforated sanding disc with a perforated velcro attachment on the disc sander. Both can be purchased online or at all good hardware stores. Drywall sanding has been unjustly linked to pollution and associated health risks. To address such issues, Edisons now brings you the Unimac Dustless Drywall Sander/Vacuum Combo Kits. Designed to make drywall sanding a safer, cleaner and more efficient practice, these tools can protect workers from harmful dust which may contain toxic materials such as lead, isocyanates and silica. Unimac Dustless Drywall Sander/Vacuum Combo Kits are perfect for both do-it-yourself and commercial applications. Each kit comes with a class-leading sander and vacuum, which also has an adjustable articulating head and four casters for superior manoeuvrability. The huge vacuum capacity is pretty amazing and so is the high quality motor design to ensure serious suction power. With fast sander speeds varying from 1000 to 2500 RPM, the Unimac Dustless Drywall Sander/Vacuum Combo Kits will surely deliver impeccable finishing results. Reaching high corners is never a problem, thanks to their lightweight telescopic design. Suitable for both wet and dry uses, each unit comes with a washable filter, waterproof power switch as well as a built-in safety mechanism to protect the motor. Other impressive features of the Unimac Dustless Drywall Sander/Vacuum Combo Kits include an ergonomic handle for a tighter grip and fuller control, a brush skirt function for an even result and a robust balanced aluminium body to withstand even the toughest working conditions. Each purchase comes with bonus accessories to guarantee total customer satisfaction. These include a filter, tool kit and 12 pieces of quality sanding discs. Edisons also offer a variety of other paint and plastering tools including Airless Paint Sprayers and Electric Paint Sprayers, Drywall Sanders, Drywall Lifters as well as Belt and Disc Sanders. Also available are high quality construction and do-it-yourself tools such as Hydraulic Press, Rebar Cutters, Cement Mixers, Compactors, Power Trowels and Drain Cleaners. Always go for a high quality sanding system that promotes reduced dust emissions and lower cleanup costs. 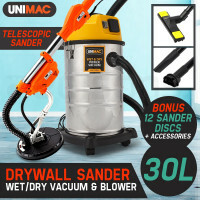 Purchase a Unimac Dustless Drywall Sander/Vacuum Combo Kit today!